Extensive studies of BRCA1- and BRCA2-associated breast tumours have been carried out in the few years since the identification of these familial breast cancer predisposing genes. The morphological studies suggest that BRCA1 tumours differ from BRCA2 tumours and from sporadic breast cancers. Recent progress in immunohistochemistry and molecular biology techniques has enabled in-depth investigation of molecular pathology of these tumours. Studies to date have investigated issues such as steroid hormone receptor expression, mutation status of tumour suppressor genes TP53 and c-erbB2, and expression profiles of cell cycle proteins p21, p27 and cyclin D1. Despite relative paucity of data, strong evidence of unique biological characteristics of BRCA1-associated breast cancer is accumulating. BRCA1-associated tumours appear to show an increased frequency of TP53 mutations, frequent p53 protein stabilization and absence of imunoreactivity for steroid hormone receptors. Further studies of larger number of samples of both BRCA1- and BRCA2-associated tumours are necessary to clarify and confirm these observations. In recent years, studies of familial breast cancers associated with mutations in BRCA1 and BRCA2 genes have suggested that these tumours have a characteristic histopathological phenotype [1**,2*]. Although tumours associated with BRCA1 and BRCA2 are on average of higher grade than sporadic breast cancer, there are also differences between tumours associated with the two genes. These data suggest distinct pathways for tumourigenesis. Significant improvement in our understanding of tumour biology in recent years has been achieved by immunohistochemical and molecular analyses of cancer-associated genes and their encoded proteins. Detection of protein expression in sporadic cancers by immunohistochemistry has enabled the identification of new markers that have diagnostic, therapeutic and prognostic value. Examples include hormone [eg oestrogen receptor (ER)] and growth factors receptors (eg epidermal growth factor receptor), tumour-specific oncogene products (eg CerbB2) and cell-cycle proteins (eg cyclin D1). Molecular analysis of the genetic alterations in tumours has also been correlated with tumour morphology and behaviour. A good example is the identification of mutations in the E-cadherin gene in invasive lobular carcinoma of breast and diffuse gastric carcinomas that have specific morphology and metastatic patterns [3,4,5]. This article reviews the immunohistochemical and molecular data in tumours associated with mutations in BRCA1 and BRCA2 genes. Clearly, this issue is important for more than just reasons of scientific curiosity, because the phenotype of the tumour may provide vital diagnostic and prognostic information for the patient. In addition, with the availability of genetic testing for BRCA1 and BRCA2 mutations within high-risk families, the morphological and molecular phenotype may help to identify patients who are suitable for mutation testing of specific genes. To date, most, if not all studies that investigated the molecular profile of BRCA-associated tumours have been performed on relatively small numbers of patients, making statistical analysis of individual studies difficult. Combined data from the literature, however, are beginning to provide a glimpse of the unique immunohistochemical and molecular profile of BRCA1- and BRCA2-associated tumours. Since the discovery of the ER in 1960, it has become one of the most important prognostic and predictive markers for breast cancer . It is well known that ER expression is inversely correlated with tumour grade . BRCA-associated tumours, which are more often of higher grade than that of sporadic breast cancer, would therefore be predicted to be more often ER negative. Indeed, numerous studies [8*,9,10**,11**,12*] have shown low levels of ER expression in familial breast cancers. Osin et al [8*,9] have shown that when ER was assessed in BRCA-associated tumours in comparison with a grade-matched control group, the expression of ER in BRCA1-associated tumours was still significantly lower (8 versus 26%). In contrast, the expression of ER in BRCA2-associated tumours appears to be similar to that in sporadic breast cancers. The detection of ER immunohistochemically does not necessarily reflect its functional competence, and a certain proportion of tumours that express ER are known to be resistant to anti-oestrogen therapy. The function of ER is dependent on the ability to transactivate so-called ER-dependent genes. Expression of progesterone receptor (PgR) and PS2 protein is indirect evidence of retained transcriptional activation activity of ER, and it has been shown that PgR and PS2 expression have stronger correlation with prognosis in breast cancer than ER expression alone . Osin et al [8*] showed that, although nine out of 40 familial breast cancer patients were ER positive, only two of these were also PgR positive (Fig. 1). This suggests that even in cases where ERs could be identified immunohistochemically, their functional ability may be compromised. Another intriguing question is at what stage of progression do tumours become hormone independent? It has been demonstrated that both the invasive and in situ component in BRCA-associated tumours have a similar status of steroid hormone receptor expression, suggesting that loss of hormonal response is a relatively early event in progression of these tumours [8*,9]. These data strongly suggest resistance to anti-oestrogen therapy of BRCA-associated tumours, and undoubtedly could have very serious practical implications in view of proposed anti-oestrogen prophylaxis for patients from high-risk families. Immunohistochemical staining of BRCA1 tumour for (a)oestrogen receptor and (b) progesterone receptor. Strong immunopositivity of BRCA1 tumour for p53 protein. A large number of studies have been performed on the functional role of c-erbB2 oncogene (HER-2/neu) in breast cancer. HER-2/neu product is a tyrosine kinase receptor that belongs to the same family as epidermal growth factor receptor. It is overexpressed in approximately 20-30% of high-grade invasive breast cancers and has been shown to be a valuable prognostic indicator. HER2/neu status also predicts response to anti-oestrogen and cytotoxic chemotherapy. Antibodies directed against the HER2/neu protein have attracted a lot of attention recently because of the availability of the monoclonal antibody herceptin for treatment of breast cancer . Clearly, the role of HER2/neu in familial breast cancer is of interest. Data on HER2/neu are limited and conflicting. Armes et al [11**] and Robson et al [12*] have not shown a difference in HER2/neu expression between sporadic and familial cancers. The study by Johannsson et al [10**], however, demonstrated that c-erbB2 expression in BRCA1-associated cancers is lower than would be predicted on the basis of their histological grade. Data from a large Breast Cancer Linkage Consortium study are awaited to clarify this issue. p53 protein is one of most important guardians of stability and integrity of the genome, and acts to prevent cell proliferation after DNA damage and activates apoptosis in case of unrepairable damage. Mutations in the TP53 gene are the most common genetic alterations in human cancers and are encountered in 20-40% of sporadic breast cancers. The frequency of these mutations correlates with tumour grade. 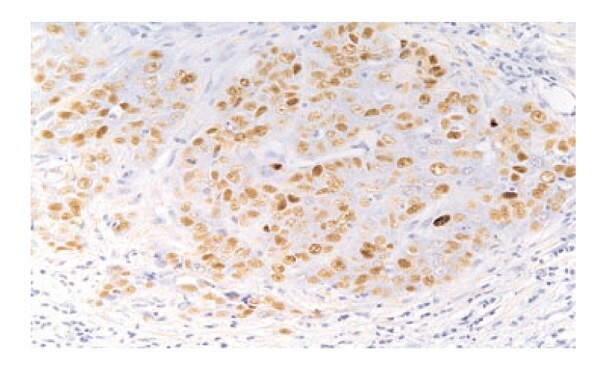 Detection of p53 protein by immunohistochemistry has become a routine method in pathology practice, and the presence of detectable p53 protein is an important prognostic marker that correlates with higher histopathological grade, increased mitotic activity, aggressive tumour behaviour and therefore a worse prognosis [15,16]. Using immunohistochemistry, Crook et al [17**] reported that BRCA-associated tumours were more often p53 positive than were grade-matched sporadic breast cancers (77% BRCA1, 45% BRCA2, 35% sporadic) (Fig. 2). Further evidence for an important role for p53 in familial breast cancer comes from the detection of mutations at a higher frequency than in sporadic cancers. The mutations in BRCA-associated cancers were often multiple and their locations unusual, which is in marked contrast to sporadic cancer [17**,18]. Studies of TP53 gene function in BRCA tumours have been performed using in vitro models. These show that the identified mutants are unique not only in their number and location, but also in their function. The mutants retain some of the wild p53-dependent activities, such as transactivation, suppression of proliferation and apoptosis induction (in particular via PIG3 transactivation). At the same time, these mutants fail to suppress transformation and they exhibit gain of function [19**]. The retained ability of some of these novel mutants to transactivate MDM2 may explain the absence of immunodetectable p53 in some BRCA-associated tumours with p53 mutations. This can occur because of degradation of the p53 protein by the MDM2-regulated, ubiquitin-depended pathway. In sporadic breast cancer an inverse correlation between loss of p53 expression and high proliferation index on one side, and low expression of the antiapoptotic gene BCL2 on the other has been demonstrated. Surprisingly two studies [11**,12*] have shown that BRCA1/BRCA2 tumours have the same level of BCL2 expression as the control group, despite being highly proliferative and with frequent p53 mutations. Clearly the regulation of both cell cycle and apoptosis is multifactorial and relatively high expression of antiapoptotic BCL2 is probably one of the mechanisms of tumour survival in conditions where apoptosis-inducing genes are still transactivated by mutant p53. The cyclin-dependent kinase inhibitor p21 blocks transition from G1 to S phase and suppresses cell proliferation. The p21 is thought to be a major downstream effector of the wild-type p53-mediated growth arrest pathway that is induced by DNA damage. In sporadic breast tumours the expression of p21 is inversely correlated with p53 expression and high tumour grade [16,20]. The proposed explanation is that mutated p53 is unable to activate p21 transcription. Immunohistochemical studies [17**] have failed to demonstrate a relationship between p21 and p53 in BRCA1/BRCA2 tumours, suggesting that p21 transactivation in this group could be mediated by a p53-independent mechanism. This finding could be of practical significance, because there is an increase in p21 expression and apoptosis in cells with wild-type p53 exposed to chemotherapy . Another cyclin-dependent kinase complex inhibitor that plays an important role in breast cancer pathogenesis is p27. There are reports that patients whose tumours over-express p27 have significantly higher survival rates. In small breast cancers (stages T1a and b) p27 expression was reported as the only independent prognostic factor . Data regarding p27 expression in familial BRCA-associated breast cancer are scarce and contradictory. Robson et al [12*] reported that p27 expression does not differ between sporadic and BRCA-associated cancers. This is contrary to our own observations, however, where we found p27 to be overexpressed in BRCA1/BRCA2 breast cancers (86% in familial tumours versus 65% in sporadic tumours; Osin PP, unpublished observations). Some studies  have demonstrated a better prognosis for familial breast cancer. If this is substantiated (and there is evidence that this may not be correct ), the overexpression of p27 could be one possible explanation. Cyclin D1 is a regulator of progression from G1 to S phase in cell cycle. It represents an important part of hormonal regulation of mammary epithelium growth: cyclin D1 is known to be upregulated by oestrogen and progestins, and to be downregulated by anti-oestrogens . The transcription of ER-regulated genes is also modulated by cyclin D1 [26,27]. Overexpression of cyclin is a D1 common event in breast cancer and is especially frequent in early onset breast cancer, probably because of high levels of oestrogens in this age group . BRCA1/BRCA2-associated tumours show very low expression of cyclin D1 in both the invasive and in situ components, however (14% in both invasive and ductal carcinoma in situ components in BRCA1/BRCA2 tumours, versus 35-36% in invasive/ductal carcinoma in situ in sporadic tumours) [8*]. Taken together with the absence of ER and PgR in BRCA1/BRCA2 cancers, the absence of cyclin D1 in these tumours could be additional evidence of hormone independence of BRCA-associated familial breast cancers. Disruption of normal regulation of the cell cycle leading to increased mitotic activity is a manifestation of tumourigenesis. In addition to traditional counting of mitotic figures, a number of immunohistochemical methods have become a part of routine tumour investigation. A high proliferative index in BRCA-associated tumours compared with a grade-matched control group has been demonstrated [1**,2*], and recent studies [11**] have confirmed it by demonstrating high Ki67 labelling index (83 versus 48%). Cathepsin D belongs to a family of proteases that are involved in the tissue remodelling. Overexpression of cathepsin D in breast cancer has been found to correlate with poor prognosis [29,30,31] and the expression of cathepsin D in host stromal cells is associated with higher intratumoural microvessel density . Expression of cathepsin D in BRCA1/BRCA2-associated breast cancers was not found to be different from that in sporadic breast cancers in two studies [11**,12*]. E-cadherin, an epithelial adhesion molecule is mutated at high frequency in invasive lobular carcinoma [3,4]. Epidemiological studies have shown a link between familiality and lobular carcinoma, although this does not appear to be a phenotype of either BRCA1 or BRCA2 cancer. Investigation of E-cadherin expression in familial breast cancer is limited, and there is no evidence at present that there are any significant differences between familial and sporadic cancers [11**]. The study of familial breast cancer using immunohistochemistry and molecular techniques is in its infancy. The studies suggest that BRCA1-associated tumours are more likely to be steroid receptor negative, and more often express p53 protein. Mutations in TP53 also appear to be increased in BRCA1 tumours. Although the data on BRCA2-associated tumours are limited at present, they appear to be different from BRCA1 tumours with respect to ER and PgR. There is no evidence that the expression of ER and PgR is different between sporadic cancers and BRCA2-associated cancers. The data on p53 alterations in BRCA2-associated tumours requires further clarification. Combining data regarding the morphological types and immunophenotypes of familial breast cancers indicates that BRCA1 tumours are different from BRCA2 tumours and sporadic cancers, and that the biological functions of the proteins these genes encode are likely to be different.